Rubin Askew, governor of Florida from 1971 to 1979. I actually remember him. He passed away Thursday morning, and will lie in state in the old capitol building on Tuesday. 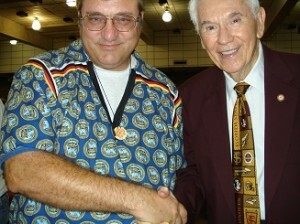 Here is a photo with me and Governor Askew back in 2009. Sorry that the person taking the pictures stood too close! Rubin Askew was one of whom I consider among the three great governors of Florida during the 20th century. He was very active in making open government and did what was right, even if the party or public held a different opinion. He was one of those who did not matter on party lines. Florida open sunshine law was something he did. He also helped to end segregation in Florida. He ran for President but lost the nomination, in 1984. And the past years he has taught at FSU and other state universities.